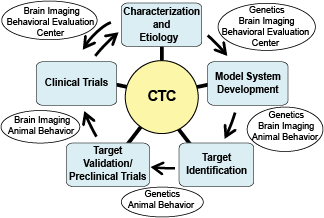 The Clinical Translational Core (CTC) functions as a service to IDDRC scientists to organize, integrate, and promote the use of translational research resources. To accomplish this, IDDRC resources are made available through: (1) the Behavioral Evaluation Center (BEC) component; (2) the Human Subjects Research Support (HSRS) component; and (3) the Translational Research Educational Program (TREP) component. Specific resources for each component are described below. CTC services are integrated through joint planning and implementation by the Core’s Co-Directors with most CTC resources located throughout the UW Health Sciences Complex.